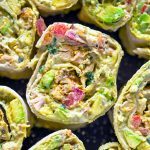 Healthy quick tortilla roll-ups loaded with grilled chicken, avocado, cheese, tomato and sour-cream. These tasty chicken & avocado roll ups are packed full of flavor and make a great appetizer or snack and are a great way to use up leftover chicken! Avocado season is in and I just can’t wait to load up on this delicious super food. Not that I haven’t been cooking with avocados all year, but now it’s just so much better not paying $2 for an avocado. 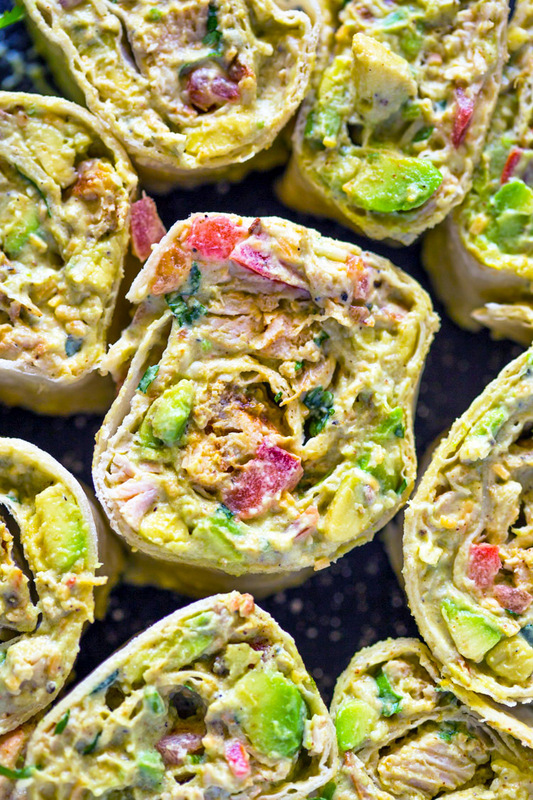 These chicken and avocado roll ups are a great way to pack some nutritious avocado into your diet. 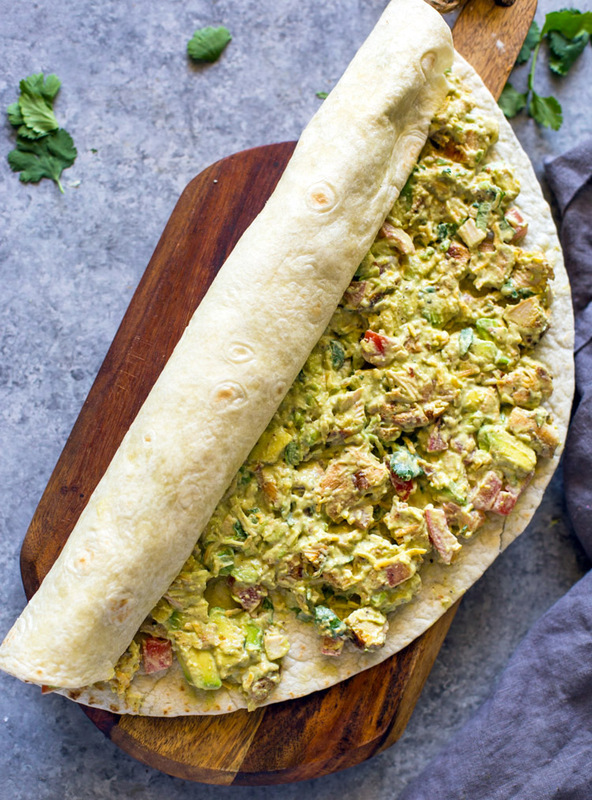 They are very similar to my popular chicken and avocado wraps, that have been pinned more than 2M+ times, yes over TWO MILLION times, I know crazy! I just never knew everyone loved avocados as much as I do! It all starts with grilled chicken breasts. I personally like to spice my chicken breasts with lots of taco seasoning and grill on the stove-top until charred, but any type of cooked chicken will work great as well. Leftover rotisserie chicken, shrimp or any type of protein is also good! The next big thing in this recipe is obviously the avocado. To make the best possible wraps, you will need perfectly ripe avocados. Picking avocados at the supermarket can be very tricky because they are either too hard or over-ripe. To find the best avocado, gently squeeze the avocado without applying pressure. If the avocado yields to firm gentle pressure, you know it’s ripe and ready-to-eat. If the avocado does not yield to gentle pressure, then it’s still firm and will be good to eat after a day or two. On the other hand, if the avocado feels mushy then it may be over-ripe. 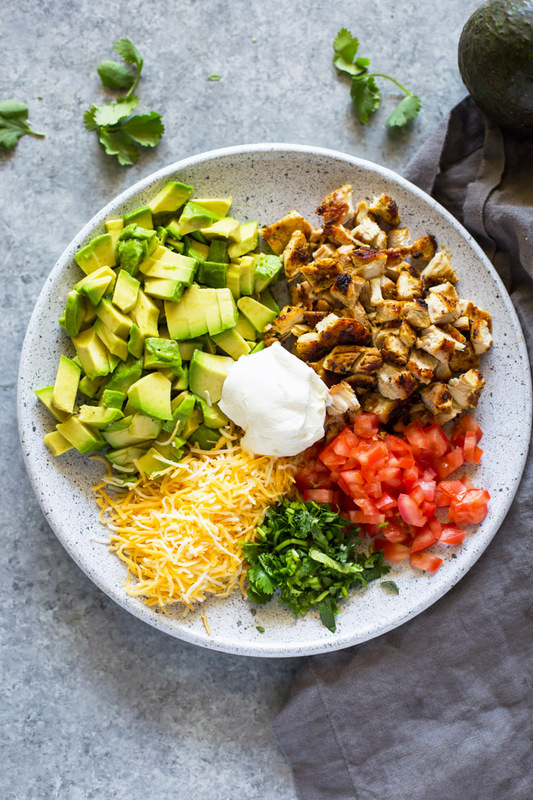 After you’ve found the perfect avocado, cut it up and combine it with diced cooked chicken, sour-cream, cheese, tomato, cilantro, lime and salt + pepper. Spread on a soft tortilla and roll up then cut into wheels. Alternatively, you can wrap the tortillas into a burrito and pan sear in a teaspoon of oil for a crispy crust. Enjoy these roll-ups warm or cold! In a large bowl, add the cooked chicken, avocado, cheese, tomato, onion, cilantro, sour-cream and lime juice. Season with salt and pepper and stir with a spoon until everything is fully combined and the avocado is chunky and mashed. Spread the mixture on equally on each of the floured tortillas and roll them up tightly. Cut in slices and place on plate. Serve right away or refrigerate until ready to serve. Enjoy hot or cold! Can you taste the sour cream in these? Not a sc or Greek yogurt fan, but these look awesome! Can i add chilly powder and turmeric poWder to spice it up? I made this tonight. It was delicious! Good quick meal on a hot summer day. How many calories would it be for a small tortiLla Filled with this? Curious, Making these as meal prep wonder if after making if it could be frozen and pulled out when ready to defrost and use? Same does the time juice keep the advocado from turning? I would not freeze these because the avocado will brown. They’re best eaten after being prepared.